Acquiring survival and prepping gear can be both a blessing and a curse. The blessing part is easy to figure out; if there is an emergency, you will have what it takes to purify water, stay warm, cook food, render first aid and ward off the bad guys. The curse part? You may end up with a closet full of stuff with nary a clue as to how it works or even if it will work when the time comes. In all fairness, I say this from my own personal experience and might be judging the rest of you unfairly. But I think not. My Radio Failed When I Needed It! Let me share an example of what happened to me quite recently. The Kaito Voyager crank radio I purchased a couple of years back was well tested. It sat next to my desk and every once in awhile I would crank it up and dial in some weather and whatever else I could catch over the airwaves. I would also use it to charge my cell phone. Ultimately, though, I needed the desk space so I packed it away in one of my bug-out-bags. When internet and cell phone service was lost for an extended period in November, I pulled out my Kaito thinking that I would get some news. It was deader than dead. Fresh batteries did not bring it to life, the crank would not charge it, and the ac adapter did nothing at all. Now I do not mean to disparage the Kaito Voyager(well maybe just a little). Instead, I am browbeating myself for not using my emergency radio on a regular basis. Evaluate the risks in your area and cover those needs first. For example, if your area is prone to frequent power outages, you are going to need emergency lighting, a propane stove, and possibly a small generator. And then, once you acquire those things (whatever they might be) use them. Learn how they work and periodically test them to insure they remain functional. A single test is not enough – after all will you still remember how they work six months or a year from now? This is not a perspective that is unique; it is one that is shared by every Prepper who has ever been required to use their preps in an emergency as well as a whole lot of others that were smarter than I was when I first got started. To help you understand the importance buying what you really need and not some useless junk, my friend Rob Hanus is back with his thoughts on both buying gear wisely and also using what you buy. It doesn’t mean that you should go into debt or use it as an excuse to buy that Remington 300 H&H Magnum rifle, when all you really need is a .22LR rifle. It can be a challenge to buy quality items when you’re on a budget, but it’s important that you don’t buy something cheap and think that it’s better than nothing. In fact, usually the “better than nothing” stuff is really worse than having nothing. Storing poor quality items can lead to a false sense of security, and finding this out at the point when you need rely on these things is not the best way to learn. At least when you have nothing, you know that it’s a shortcoming and will compensate for it. The equipment you buy needs to be rugged and capable of withstanding hard, daily use. If you’re afraid to use it now or tend to “baby” it, you really should ask yourself why you have it. Here’s an example from my past. When I was in my 20s, I bought this really cool survival knife. It was a copy of a Buckmaster Survival Knife. I couldn’t afford the real Buckmaster, so I got a copy instead – only mine was cooler because it was black instead of silver. It had these spikes that screwed into the hilt and a hollow handle with a small survival kit inside. The blade was a Bowie style, but the secondary edge was serrated and the spine had these deep cuts. While I carried this knife with me everywhere, I couldn’t bring myself to actually use it. I didn’t want to scuff up the finish or dull it. I babied it, simply because I was “saving” it for when I needed it. Yes, that sounds strange, but hey, I was in my 20s. My first clue that this knife was garbage should have been when I couldn’t put a sharp edge on it. The second clue should have been when the wire saw broke within 10 seconds of using it. I was pretty thick-headed and ignorant back then (did I mention I was in my 20s?). After about 4 or 5 years of carrying this knife around and thinking that this was the “go to” survival knife I was going to be able to rely on to get me through any survival situation, I finally decided to test it. I can’t tell you why I finally had that thought, but I decided to try doing a simply task of chopping some wood. No words can describe how I felt when the knife failed me after only hitting the wood three times. The blade, that was bolted into the hollow handle, came loose and twisted freely. The knife was junk and if I had been in a survival situation and needed a good, rugged, reliable knife, I would have been S.O.L. However, that lesson was one that would stay with me for the rest of my life, as I decided right then and there that I would never have another junk knife, no matter what the cost. Though it took a few years to save up for it, the next knife I bought was a Cold Steel Trailmaster. I have, literally, abused that knife to see what it can do and it has yet to fail me. I know, beyond a shadow of a doubt, that I can trust that knife in a survival situation. That’s the same confidence I want with every piece of gear I have. The lesson here is if you’re afraid to use, and in some cases abuse, something in everyday life, it’s not going to withstand the harshness of a survival situation. You need to test your preps and gear. I use this principle on everything I buy today. I might not buy the most expensive or the best, but I get the best for what fits in my budget. If an item fails, I determine why it failed and look to replace it with something that won’t fail like that again. Learn what makes an item good and buy the best grade that you can afford. And then test everything. If you didn’t test it, it doesn’t work. About Rob: Rob Hanus frequently posts original podcasts on his website at the Preparedness Podcast. He also is the author of an eBook, the Preparedness Capability Checklist which can be purchased from links on his website. His podcasts are informative and his Prepper News Watch is the best. You can bet that his book is good as well. When it comes to gear, the guiding principal for every Prepper should be to buy the best you can afford and then to use it as part of your daily life. That does not mean you should shun $3 flashlights and $5 knives. It simply means that after assessing your needs, you determine what is best for your budget and you situation and make an educated purchase decision. Become friends with your stuff. Learn to use it and enjoy its benefits now. You will thank yourself later. New: Click Here To Vote For Me at Top Prepper Websites! Bargain Bin: The Backdoor Survival article on DIY cleaning turned out to be hugely popular all around the web. In case you missed it, here is a link to the article Prepper Checklist: DIY Cleaning Supplies and to some of the products that I use to make my own cleaners. Maximal Power FC999 Universal Battery Charger: This nicely built charger will charge charge AA, AAA, C, D, N, 9V, Ni-MH, Ni-CD, and Alkaline batteries. It has an LED display so that when you first put a battery in the charging bay, you know whether it is viable for charging or simply bad and ready to go back to the recycle box. See How to Recharge Alkaline Batteries. Blocklite Mini Compact Size Ultra Bright 9V LED Flashlight : One of my readers (James) claims that these work great. There is a similar flashlight called the Pak-Lite (which is more expensive) but it does not have a high-low switch like this one. Less than $10. NOW Solutions Glycerin Vegetable, 16-Fluid Ounces : You will need this for your Dirt Cheap Soft Soap. I paid almost as much for only 4 ounces locally. This is a great price and 16 ounces will last forever. NOW Foods Peppermint Oil : I favor peppermint essential oil (okay, I like lavender too) so this is what I get. 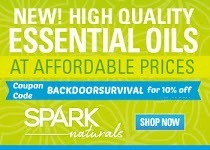 But there are many types of essential oils to choose from. Take your pick. One thing you will find is that a little goes a long way. Note: I use inexpensive EOs in my cleaning supplies and reserve the higher quality Spark Naturals Essential Oils for therapeutic and healing use. The monthly specials at Emergency Essentials feature discounts of up to 35% off sometimes a bit more. Every family should have at least one Tote-able Toilet. I have priced purchasing the bucket and toilet seat lid separately and found that it was more economical to pick up this kit. I have filled my portable potty with sanitation supplies plus, of course, plenty of TP. 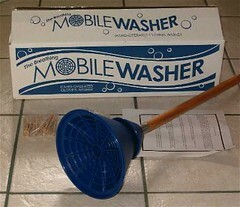 I also recommend the Mobile Washer. This is hand operated washing machine. Like a plunger, it uses a technique of pushing and pulling the water through clothes to clean them well without wearing them out. It uses a minimum of water and less soap due to the agitation motion. Use in a bucket (5-gallon suggested), sink or tub. The best part is the price – only $14.95. Lifestraw vs Survivor Filter: Which Personal Filter is Best? Fences that Keep People Out: Smart, Or a Bad Investment? I agree with the adage to use what you store, and store what you use, BUT. I bought my shortwave radio to use after the crap hits, and if it is being used when an EMP hits, you are out of business. I keep my survival electronics in a faraday cage and you cant use them while stored there. I agree with you on the EMP part but what I think this article is saying is that, if you have equipment that you haven’t tested to insure its good to go, how can you trust that it will work when you really need it to? On surviveforlife.com I talk about the importance of knowing whats in your bag and how to use it. Boy, oh, boy, is that correct. Stuff which doesn’t work when you really need it it is a false promise: It says it will take care of you but it won’t. I no longer bother with crank radios because I have never found one which works after 6 months of lying around unused. Some people say that I should just use it regularly, but neither my wife nor I do listen to radios other than in our vehicles. That is just the reality of our lifestyles. Better to have radios which are suited to the way we actually live, rather than kid ourselves into thinking we will ‘exercise’ our radios every couple weeks (and I have no reason to believe that ‘exercising’ them would help). Instead we keep multiple radios available, with a big store of batteries. Maybe that isn’t the ideal solution, but it is a lot better than relying on crank radios which don’t work. We also use most of our emergency gear and supplies because we go camping a few times a year. That way we can try out our stuff in a non-emergency but realistic environment. We know our camp stoves work, and how to use them, because we use them three or four times a year. Ditto the tents, machetes, freeze dried food, flashlights, inverters, etc. In fact, we are going camping soon and will be taking foil packets of some Mountain House breakfast and dinner entrees specifically so we can try them out. Then we can add #10 cans of those we prefer to our long term supplies. So far we haven’t found any we dislike, but some need extra spices to enjoy. That is good to know: They are all palatable without modification, but better with added spices. Knife: Years ago…yes, in my 20s…I splurged on a Randall #1-7, seven inch carbon blade with a leather washer grip. All my reading said this make/model was absolutely the cat’s meow. Well, maybe for some, but not for my purposes, and I am the one who counts here, not the guy in the next suburb. When I actually used it (I should have been warned by the horror that concept engendered among many knife guys: modern Randalls apparently are supposed to lie pristine in a wall case) I discovered that the grip was WAY too skinny for a decent, comfortable hold. It provoked cramps in my hand. I wrapped it with a leather bootlace and that took care of that problem. I also discovered by actually using it that it was lousy for processing root vegetables: the blade is so thick that is will cut a fraction of an inch into a carrot or a potato, then act as a wedge: I have to split them with the multi-hundred dollar Randall. At the same time, it is a lousy chopper because it is too short and light. It may well be a great fighting knife but it is not a good general purpose knife for me. For years it sat on a magnetic knife holder in the kitchen, retired to noble status as Chief Pizza Slicer and Guest Freaker Outer. (How many normal metrosexuals keep a seven inch bowie knife on their kitchen rack? Forget the ten inch chef’s knife right next to it: Bowies are SCARY) Now it just sits in a bottom drawer in a bedroom. A better all round knife for my purposes would be a KaBar Cutlass Machete, for less than $50. It isn’t a lot heavier, chops like a machete should, can be used in a pinch to process food, open cans, and yes, even go all Walter Mitty on Seriously Bad People in my dreams. If curious, go to Randallknives.com and look at the #1, seven inch model. It is gorgeous, and it lists at $365. It is now December, 2013. They are currently scheduling delivery dates in May of 2017. If you want one now you will have to buy from someone else, and you will likely pay somewhat above list. Yikes. When I go into the woods, my purposes are best served by a good pocket knife like a Victorinox Swiss Army Climber, and a KaBar Cutlass Machete. That combo would be inappropriate for many, which is why we should get familiar with our gear before we need it in an emergency. What works for me may be lousy for you, and vice versa, even when gear is good quality. When gear is poor quality, it will likely fail to work at all. It is better to find that out in a non-emergency environment. I might add for you to ‘maintain’ your equipment also. A few years ago I bought a 3.5KW generator. I went that day and filled the tank. I ran it a few times, once a month for 3 or 4 months. Then I got busy and forgot about it. The next summer our electricity failed. So did the generator! I had inadvertently put ethanol in it! All moving parts in the carb had become glued together! After a few days of scraping and cleaning I managed to get it to running again. Now I make sure to use only 100% gas, and also to run it with the gas shut off until the carb is empty. Also, either use stabil in the gas or drain the tank before the gas ages too much! Oh, I did get lucky that the electricity was only off for a few hours that time. When it was off for a week this year the generator more than paid for itself. 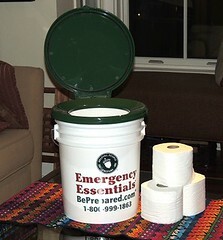 I put first aid supplies in an orange HD plastic bucket about 6 or seven years ago, and opened it up a few months ago. Most things were fine, but the elastic bandages, in ZipLock bags, had an incredibly strong chemical smell. It was time to toss and replace, so I did. So, in this case I didn’t maintain the bandages, but the overall kit by replacing the seriously nasty parts. At the same time I also went into some stored toilet paper (we keep it separate from the day to day stuff) and decided that while it was still usable, it was time to replace the stored stock. It was nice to see that we are buying much nicer TP these days, as well. Great tips, Gaye! I buy the best quality knives, tools, etc. I can afford. Buying cheap many times or buy quality once. As far as tools go, I’ve found some amazing ‘rusty’ axes and other hand tools at yard sales and thrift shops. After restoring them, which I enjoy doing anyway, they make long lasting tools and eventually will be passed down to family. Cheap Made in China stuff – not so much. Can’t agree more about using your stuff and gear. we use our crank radio everyday to get the weather on the weather band. It’s a nice together morning ritual and it keeps our radio working well. Frankly we haven’t done a lot of other stuff, but I am always collecting and thinking, and reading over this, I guess we already have a lot of the tools part covered, I use cloth instead of sposies for all my linens and even TP for myself, so that’s pretty sustainable, I have a set stored for later since my cabinets were too full. where we need to get on the stick is batteries and other consumable items. We’ve been focusing on getting our soil improved so we can actually grow something decent to eat since we live on a sand dune. Excellent advice! Todd Walker posted an excellent comment about “rusty axes”; I have a couple of those myself. With axes and in many cases, knives, the old stuff is FAR SUPERIOR to much fo the current stuff. AND it’s often far cheaper. Got one of my axes for $5. Regarding storing radios and other electronics: You MUST exercise them regularly! These devices contain parts such as electrolytic capacitors that fail with age – especially if you don’t use them. To exercise a radio, turn it on in a room and go about your business. Come back in a few hours or so, turn it back off, remove the batteries, put it away, and forget about it for a month. Next month, do this again. We have had a Grundig crank radio that has AM/FM SW1 SW2 & a flashlight for years & every time we lose the power & phone it is our connection to the outside world. It sits there ready to grab when needed. We bought my father a solar Eton because he would not crank it & likes to hear his games. He has had that for several years. If there is an EMP attack, what are we going to be able to get on our radios? Are all the radio stations in Farady Cages? I totally agree that you should regularly test what you buy, but I’d also add that some folks make the mistake of thinking that a shortwave receiver is “the” radio to buy. While I understand the idea, listening to radio stations outside of your immediate area won’t provide you with the detailed knowledge of what’s going on around you. Sure, you can switch the shortwave radio to pick up a local station as well, but handheld two-way VHF/UHF radios can not only listen to local commercial stations, I also have the option of talking to other people. Having the ability to communicate (not just listen) makes a BIG difference in your tactical awareness capabilities during a survival or emergency situation. I’d suggest that you forget about the FRS-D (For Really Short Distances) and/or CB radios (unless your idea of acceptable range is either less than 1/2 mile (FRS) or you don’t mind where your signal will land (CB) and start looking into better options for real communication when you need it most. Fortunately the cost of many of these radios are well under $100 (some much less) and having one radio that can talk on FRS, GMRS, Marine, MURS, 2m Ham, 70cm Ham (six bands), monitor many local public service and weather frequencies, listen to FM commercial radio, and comes with a built-in LED flashlight (while clipped to your belt and weighing just a few ounces) is really handy. After you get used to what this type of radio can do, it really becomes an everyday carry item, since just like a gun it does you little good if it’s at home when you need it the most. Craig – You bring up many valid points. I am currently both studying and taking practice tests for my Tech License. The test will be on April 18th and since I am not very proficient at electrical theory, I take my studies seriously. Wish me luck!